Music is a real strength at St Swithun’s. we have our own orchestra as well as a vibrant choir. Music in our school encourages pupils to be ‘Careful Listeners’, ‘Creative Composers’ and ‘Confident Performers’. Within the class music lessons children will experience music from different times and cultures. They are taught about the different ways music can be structured, how to recognise and use different instruments and develop an awareness of how music can create a mood or an emotional response. As well as using tuned and un-tuned instruments, all children are encouraged to develop their singing techniques for assemblies and school productions. Children have the opportunity to join the choir, which currently has over 40 members, singing at various events throughout the year both in school and at other venues including The Guildhall, Portsmouth and St Mary’s Church. Peripatetic lessons are organised for violins, woodwind, brass, drums, guitar and recorder, for which parents pay a termly fee. 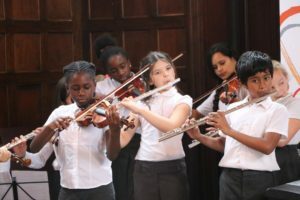 The school orchestra is open to all pupils who learn an orchestral instrument either in or out of school.